Que pensez-vous des classes d’actions à droit de vote multiples ? Vous souhaitez en savoir davantage sur les tendances en ce qui concerne les actions à droits de vote multiples dans le contexte des É.-U. 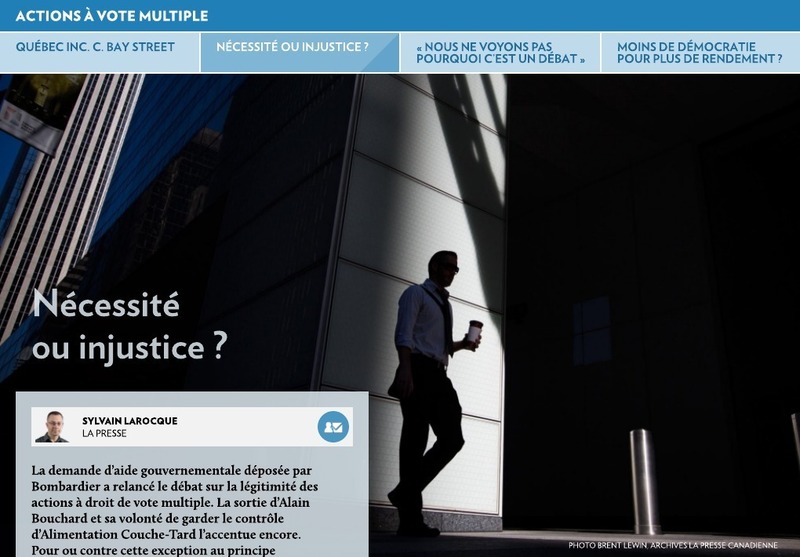 L’article* ci-dessous, publié sur le forum du Harvard Law School, fait le point sur ce sujet. Comme vous le constaterez, les avis sont assez partagés sur les pratiques d’émission d’actions qui imposent des droits de vote différents selon les classes. Certaines compagnies, dont Snap inc., ont poussé un peu plus loin la logique des classes d’actions en proposant une catégorie d’action sans droit de vote. Les compagnies qui ont osé offrir cette classe d’action ont connu des chutes de prix après l’offre publique d’achat (OPA). Cependant, cela n’a pas découragé d’autres entreprises de la Silicon Valley de faire des offres d’actions à droits de vote multiples. À cet égard, je vous renvoie à mon article du 17 mai 2017 intitulé « La gouvernance des entreprises à droit de vote multiple ». Les deux plus grandes firmes de conseil en votation, ISS et Glass Lewis, ont de sérieuses réserves concernant ce type de structure de capital. On sait qu’au Québec, cette structure d’actionnariat est assez répandue, et même encouragée. À la lumière des tendances présentées dans l’article, quel est l’avenir de cette approche à l’émission d’actions ? This past year has been marked by significant and, in some cases, opposing attitudes and practices with respect to multi-class share structures. We are likely to see some of this churn continue in 2018 as the various market participants continue to define or refine their positions on this issue. In 2016, a coalition of investors and pension funds lobbied against multi-class structures and, in 2017, the Council for Institutional Investors (CII) was vocal about its view that one vote per share is central to good governance. This movement is largely in connection with a minority trend of multi-class high-vote/low-vote and, sometimes, no-vote equity structures. In the spring of 2017, the initial public offering (IPO) of Snap Inc. put significant pressure on the issue when Snap offered its no-vote common stock to the public, followed shortly by Blue Apron’s IPO, which sold a class of low-vote stock to the public, while its capital structure also has a class of non-voting stock. Both companies suffered significant stock price drops following their IPOs. In response to growing market pressure, in summer 2017, the S&P Dow Jones banned companies with multiple share class structures from inclusion in several of its indices (while nonetheless allowing for the grandfathering of companies that are already included in the index), the FTSE Russell announced it would begin excluding from its indices those companies without publicly-held voting stock representing at least five percent of a company’s voting rights and, in November, MSCI announced its review of unequal voting structures and its decision to temporarily treat any securities of companies with unequal voting structures as ineligible for certain of its indices. In addition, proxy advisory firms ISS and Glass Lewis piled on with the recent release of policies that result in their recommending voting against board and/or committee members at companies with dual-class structures, depending on other governance factors. Furthermore, Glass Lewis’ 2018 voting policies indicate that for companies with disproportionate voting and economic rights, it will carefully examine the voting turnout on proposals and if a majority of low-vote shareholders support a shareholder proposal or oppose a management proposal, Glass Lewis believes the board should demonstrate appropriate responsiveness to this voting outcome. Despite this pressure, many companies, so far at least, seem undeterred in their pursuits of going public with a multi-class structure as a way of preserving founder or early investor control, in part in an attempt to combat the trend in increasing short-term, activist and other shareholder demands. Significant IPOs with dual-class stock occurred in the latter half of the year—after the indices’ ban—including Roku, CarGuus, StitchFix, Sogou and Qudian. Importantly, NYSE and NASDAQ continue to permit, and even actively court, multi-class companies for listing. And momentum may be increasing internationally as well. After failing to attract the 2014 Alibaba IPO, the Hong Kong Exchange recognized its struggle to capture market-share for new technology companies with untraditional capital structures and issued a proposal to permit companies with multi-class structures to list IPOs on a new listing board. More recently, the Hong Kong government signaled its willingness to amending existing rules to permit multi-class companies to list under the status quo. So far, the Securities and Exchange Commission (SEC) has largely side-stepped the issue in its regulatory agenda. In the fall U.S. Department of the Treasury report, the Treasury reiterated that corporate governance and shareholder rights are a matter of state law and recommended that the SEC’s role continue to be limited to reviewing the adequacy of disclosure and effects on shareholder voting for companies with dual-class stocks. It may be premature to know the impact that the ban by many of the indices will have on the desire for companies to go public with multi-class structures. After all, many IPO companies are not eligible for immediate inclusion in any index (and each index has its own set of requirements). For instance, the S&P 500 has requirements on the length of public company trading (12 months), market capitalization ($6.1 billion) public float (50 percent of the class of stock) and performance (the sum of the four most recent consecutive quarters’ earnings must be positive), that make it impossible for a newly-public company to be listed inside a year and, for some companies, a significant number of years post-IPO. The strength of the indices’ ban will be tested when a recently-public multi-class company achieves significant growth and would otherwise be eligible to be included in an index. Will some of the largest index-based funds, which may conceptually prefer equal voting rights for all shareholders, be satisfied with being left out of a company’s shareholder base because the company’s multi-class structure otherwise precludes it from being included in the index? According to an analysis conducted by State Street Global Advisors using data from FactSet, companies in the S&P 500 with multi-class stock structures outperformed their single-class counterparts by approximately 26 percent cumulatively over the 10-year period ending in 2016, and exclusion of those companies would have resulted in underperformance of the index by approximately 1.86 percent over the same period. Already BlackRock, the world’s largest asset manager and a signatory on the coalition of investors advocating for equal rights for all shareholders, has publicly bristled at the thought of limiting returns for its clients due to the ban and has publicly disagreed with it, stating that “policymakers, not index providers, should set equity investing and corporate governance standards” and that it would support shareholder review of a company’s capital structure periodically through management proposals in the company’s proxy statement. Depending on stock performance of the IPO class of 2017, the first potential test case could occur as early as 2018 and this will be a development to monitor throughout the year. *Pamela Marcogliese is a partner and Elizabeth Bieber is an associate at Cleary Gottlieb Steen & Hamilton LLP. This post is based on a Cleary Gottlieb publication by Ms. Marcogliese and Ms. Bieber. Related research from the Program on Corporate Governance includes The Untenable Case for Perpetual Dual-Class Stock by Lucian Bebchuk and Kobi Kastiel (discussed on the Forum here).